Driving the back roads from Dungeness to Reading I stumbled across the Carr-Taylor vinyard and spent a good morning in the sunshine with the staff and chipper terriers. We wandered around the Vinyard, sat and tasted wines at long tables in the wineshop, talked about the history and workings of their business. They made me feel like a special guest more than a tourist and shopper. They mainly sell wine through local stores because they can’t produce sufficient quantities to supply supermarket chains. 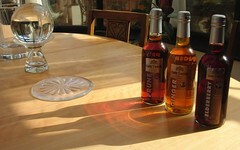 English vineyards produce high quality white wines, meads and champagnes. None of the rebellious ‘jump off the plate, run up your nose and tweak the little nasal hairs’ cheeses for me. No. My cheese lies submissively on the toast. Raw and ready. It slips down my throat and pimps up my dreams. 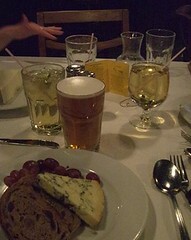 On Friday in Joe Allen’s* Exeter St. restaurant Mrs. Pouncer partook of some Chardonnay, Scarlet Blue imbibed some Mules and I took a small Boddingtons or four. I can unreservedly, with miss spellings and split infinitives, confirm that Mrs. Pouncer is in person everybit the stylish counsellor that her entertaining blog suggests. During our brief encounter I discovered the true extent of my lack of knowledge of advance eyewear handling techniques. Mrs. Pouncer arrived at Joe Allens equipped with both fabulous stories and the four sets of eyewear necessary to fulfill all advanced eyewear handling techniques. Needless to say I learned a thing or three. I can also confirm that Ms Scarlet Blue’s hair was of a certain colour and that meeting her has brought new dimensions to my understanding of the word ‘cute’. * no relation of Mrs. Pouncer’s acquaintance Keith Allen, father of Lily Allen. All cheese is theoretically comfort cheese. But. Cheese in YOUR fridge is less comforting than cheese in MY fridge. 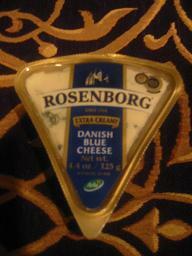 Comfort cheese is nearby, normally in my mouth… …..mmmmmm…. Seventh report in my ongoing investigations of cheese dream-inducing properties. Conclusion Mum was right for Stilton. 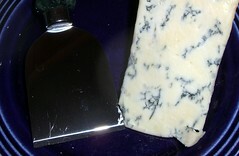 I recommend not eating Stilton for supper. Nightly sleep disruption was unusual and unpleasant. The dream content was not substantially different from my normal dream content. The dreams didn’t warrant the ‘unusual’ label given to the female dreamers in a study conducted by the UK Cheeseboard where: 85% of females who ate Stilton had some of the most unusual dreams of the whole study. Memory enhancement No storyline. No plot. Less like a dream, more of a vivid lucidly manipulated visualisation. I remembered my uncle who died 20 years ago talking and laughing in his home. It was good to see him again and remember the sound of his voice and laughter, to see the way his whole body shook when he laughed, to hear him jangling his keys in his pocket just like his brother, my father still does. I saw him more clearly than I can remember him in waking hours. Forgotten. All I remember is waking up briefly in the night thinking ‘that was a sad dream, I must remember it’ then falling asleep again. When I woke in the morning I couldn’t remember the dream, just the mood. Celebrity Kitchen. During most of this dream I was in the kitchen of a large Victorian terrace house during with David Bowie creatively exploring the versatility of vegetables and kitchen utenisils. Yummy. I think it was a party but I didn’t see the other partiers in the house. Work. This is a common theme in my dreams during normal working weeks. This specific variation combined and extended things that happened during the working week. Decontamination Phase. 2/2 nights without eating Stilton in the evening produced refreshingly deep sleep where I did not wake during the night or recall any dreams. dream mood varied from sad through reflective, serious, to happy. Content varied from parties and work to detailed visual experiences. remembering the dreams varied from easily recalled detail through to difficult to recall whether I had even dreamed. sleep disruptive, I woke every night, then fell asleep again fairly promptly. Sixth report in a popular sporadic investigation collecting cheese dream-inducing properties. Eating phase for Havarti: 5/6 nights produced dreams. Dream memories lasted beyond breakfast. Dreams were based in rare though normal life activities. Moving office with appearances from colleagues across my 20yrs as a working gal. The building that we moved into used fireman’s polls as a way to get downstairs. Reminiscent of ‘snakes and ladders’. Quite a lot of fun was had by all as we unpacked our boxes, drank lashings of tea, tried the firemans polls and had water-fights. Visiting the beach with Flat Eric and a climbing club that included everyone I’ve ever climbed with and some people that I know climb but haven’t climbed with. Flat Eric did some amazing technical moves on some overhangs then we all went wind-surfing and small dhingy sailing in a Costa-Rica type location. Faerie Tour of UK pubs. In a storyline that could have been produced by a collaboration between Harold Pinter and Alan Bennett my friends and I spent a summer touring real-ale pubs, Inns, staying in them and regularly dressing-up as faeries is the evenings. Some larger fellows look a tad silly when wearing faeries outfits. My outfit was black and actually maps to many clothes that I have in my closet, though I don’t have a black tiara and wings. The dream mainly covered our escapades on tour. Excellent fun. Conclusion? Very nice result. 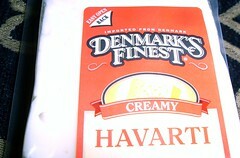 I’m not publishing a decontamination phase because I plan to stay with Havarti for at least a couple more weeks . exaggerations of pleasant plausible realities. persisted into early waking hours memories. social events full of actual friends, family and work colleagues from throughout my life. excluding wierd morphing of people and things into wierd unfamiliar people and things. Mind altering drugs. Purchased over the counter! The list below identifies substances that can be purchased legally in many shops, without permit or prescription. These substances change mind-body. The change is normally very pleasurable. The occassional bad trip is barely noticable and not blog-worthy. Eating 2 huge waffles drowning in cream. Just the thought of sugar for breakfast makes my stomach turn. Give my curry on toast anyday! eating cheese & ham omelette because curry on toast wasn’t on the menu (neither were Heinz baked beans). Sigh. Ah, so for this USian, Slim = must ‘Work-out’. Must avoid provocative prejudicial comments about afluent greedy Americans being obese because the culture encourages ‘gorging’ themselves on unnecessary food. Food is cheap here. It’s a stereotype that is difficult to shake-free even when living in the US. How can I explain this tactfully? Europe has a ‘growing’ problem of obesity. As usual, Europe is ‘behind’ America in this trend, but catching up quicky. A side effect of wealth and capitalistic lifestyles? I’ve been in the US for 6 years. I’m approximately the same size as when I arrived. 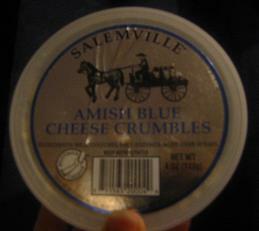 This week I’m eating Salemville Amish Blue cheese from Wisconsin. It is moist, flavourful, crumbly and tongue-slitheringly creamy…. I was with my mother on the coast somewhere – the coasts were rather open and vast, somewhat influenced by photos I saw on Flickr.com. I climbed down a rocky ravine to get down to the beach (this is more influenced by the upper Algarve) My mother was urging me on. But, true to style, I got stuck and was in grave danger of falling off and breaking a good few bones. It starts off with a Japanese boy being interviewed in a tv programme about a plane crash he was involved in. For the sake of clarity I think the Japanese boy is the author’s alter ego. He couldn’t be much further removed from the author’s ethnic profile, but there you go. As the interview progressed, images from the plane crash were shown, which, of course, then became a reality, or a dream reality let’s say. The Japanese boy was pinned to the back of his seat terrified as the plane was losing height very quickly. He was aware he was about to die. At this point the author chose to terminate the performance as he knows plane crashes are rather distasteful. He woke up breathless, but this was probably more due to dust mite allergy than anything else. From a scientific point of view – to what extent did the cheese have an effect on the subjects dreams ? a – The subject is a regular air traveller. He has experienced some very intricate flying manoeuvres, especially in Iberia planes over the sea whilst coming in to land at Barcelona airport. Some pilots should understand that planes do not make u-turns like a stolen car would do when driven by tearaway teenagers. b – He is a fan of Johan Grimonprez’s “Dial H-I-S-T-O-R-Y http://www.medienkunstnetz.de/works/dial-history/, a art video film mainly about hijackings. He has seen it again twice recently at the Caixa Forum art centre http://portal1.lacaixa.es/Channel/Ch_Redirect_Tx?dest=1-38-00-00000. In the film there are interviews with hijack hostages. There are also Japanese in the film, both hostages and Red Army hijackers. For American sensibilities this is probably not a recommended film. c- He suffers from allergies and asthma, so any dreams involving frightening, breath-taking situations may be attributable to this. Hope you enjoyed the show. Thank you and goodnight. varied cheese intake. (Roquefort bread, Brie, Cream cheese, Edam BabyBel). Yummy! Fourth report in my ongoing cheese investigations. 5/5 nights produced no awareness of dreams. 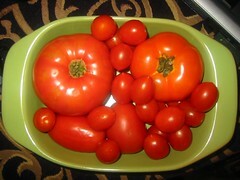 Half way through the week I skipped the supper and that night had an Outstanding, unpublishable, dream. 1 Vivid, long, extremely enjoyable dream about living in a Victorian red-brick townhouse with many colourful guests and secret passage-ways under carpets & behind furniture. Wonderful textures and details. I ate seafood on the two nights that I didn’t eat Edam and did dream. I don’t normally eat seafood. Edam is a dream supressant. Seafood may be a dream stimulant. This week I’ll be eating mostly mini Babybel. What is really brilliant is that this list could go on and on and on and on…. …there are soooooooo many brilliant thangs… …your brilliant list of things is probably different. May include furry bedding or something. What-ever, lots of goodies for the holidays. Third report of my cheese-dream intestigation. 3/6 nights produced dreams. Nothing vivid, lucid, outrageous. Nothing where the content is even worth reporting or ‘unpubishable-ing’. 3/6 nights. No dreams. Pah! 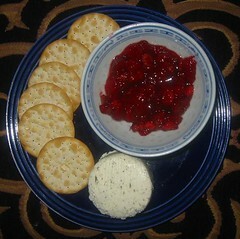 Decontamination phase (no cream cheese supper): 1 night. 1 forgettable dream. Rather like not eating a cheese supper at all. Pah! Recommended for the unadventuous. I’m beginning to suspect that soft cheeses are just not dream-tastic. 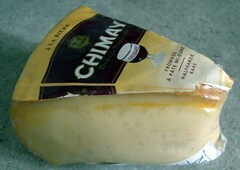 This week I’ll be eating Edam. I dreamt we were in your kitchen, each making his or her own breakfast and talking about <unpublishable>. You filled your French-style coffee bowl with frothy hot milk and I ate my weetabix from a large white cutlery tray. You were displeased when I accidently put sugar on top of your frothy milk. All 6/6 nights consistently produced looooooooong, dull, dream sequences. Dream content was forgotten quickly. I did manage to remember scenes of ‘packing’ and work related problem solving. Yawn. With one disturbing exception the dreams were soooooooo dull they sent me straight back to deep sleep! The exception on the 3rd night suddenly woke me from a dream of my death (Saber plunged into my heart). Unlike the British cheeseboard study participants, I would not summarise the dreams as either ‘Nice’ or ‘Cryptic’. 1 night. No awareness of any dreams. For me, Brie produces dull, forgettable, dreams. I’m looking for action-adventure with good and bad guys, shape-shifters, magic, high-speed chases and unexpected wackiness. ‘Nice’ doesn’t really describe what I’m looking for. Were the girls using ‘nice’ as a euphemism for something more ‘naughty’ (unpublishable)? 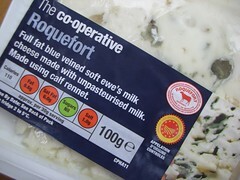 That might explain why the boys eating Brie reported experiencing ‘cryptic’ dreams. At a euphamistic level more girl-‘nice’ dreams would be an EXTREMELY good result for Brie. Just incase, I’ll double the planned portion for tonight. I had a ‘long’ dream last night but I wasn’t sufficiently lucid to know if it was ‘nice’ or not…. Eating phase (supper): Throughout the 7 nights after eating soft goat cheese I was unaware of any dreams. 1st evening had a fairly short ‘dull’ dream. 2nd evening dream involved steering a thick Persian rug down a steep tree-covered mountainside. Hooray! Much fun. Conclusion? For me, soft goat cheese is a dream supressant. 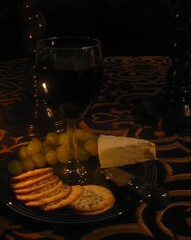 Tonight I’m shifting to Brie. …mmmmMMMMmmmmm…. Driving through the backroads of Leicestershire. I drive straight to SnewTea’s new home in Leicester city center. His home is a stunning victorian townhouse near ‘The Charlotte’ concert venue. This is wonderful. I think I’ll move to Leicester too. I’ll be able to walk to great gigs and find my home and car easily because I know my way around. It was a pleasing dream. the commute from Leicester UK to NW USA is impractical. I got lost trying to find my way back from SnewTea’s actual new home. As reported the research is fundamentally flawed because we don’t know what these people dreamed about when they weren’t eating the specified cheese, or what other potential dream modifiers they were experiencing (e.g. alcohol, waking-events etc)…. Doh! Nonetheless, it is a fun little read. 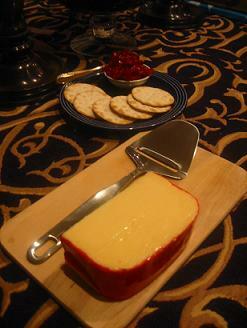 That the UK has an official body called the “Cheese Board’ caused rampant, cat-scaring, guffawing in the Wendy House. I will start investigating the US-cheese-dream relationship for one gal, unsponsored, uncontrolled, and un(counter)balanced, on high doses of tea….